Gregory Winship, who works for the Center for Conflict Resolution in Kansas City, Missouri, in front of Eastern Mennonite University’s Center for Justice and Peacebuilding in Harrisonburg. Howard Zehr, sometimes called the “grandfather” of restorative justice, lives in Broadway, Virginia. 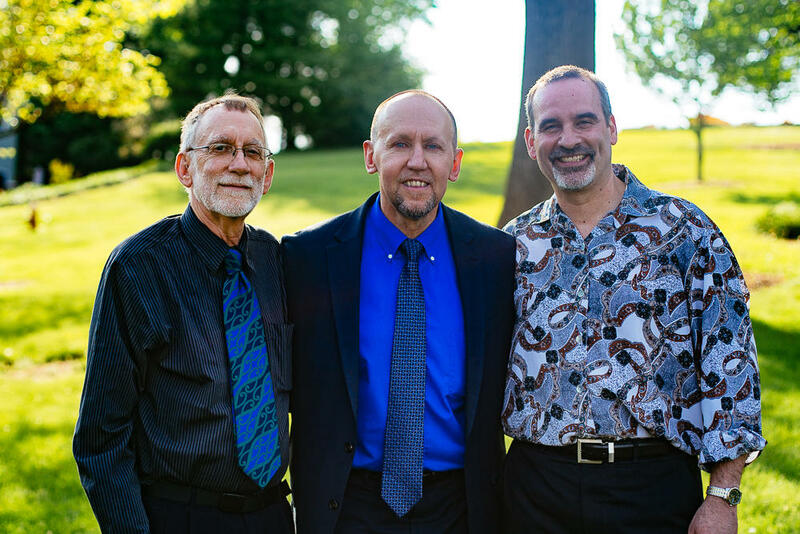 Gregory Winship, the first graduate of Eastern Mennonite University’s Master of Arts in Restorative Justice program, with Howard Zehr (left) and faculty advisor Carl Stauffer. After serving two decades in prison for complicity to murder, Gregory Winship was granted parole, in 2010. Just a few days ago, in Harrisonburg, he became the first to receive a master’s degree in restorative justice from Eastern Mennonite University. WMRA’s Christopher Clymer Kurtz reports. For Gregory Winship, restorative justice isn’t just a course of study. GREGORY WINSHIP: So I spent more than 20 years in prison for a crime I did commit. Because of things I did or didn't do, people lost their lives. If we could ever have one thing back in our life, of course that would be mine. It's difficult to put that into perspective and how do you keep that in perspective every day of your life when the worst thing you've ever done is kind of a defining moment. As much as you'd like to be able to take that back, as much as you'd like to be able to make better choices and make better decisions, as far as where you were, what you did or didn't do, that can't be changed, right? It was in prison that Winship first learned about restorative justice, which focuses on repairing the harm of crime. Winship learned what more he could about Zehr and restorative justice. Two years ago, Winship began studying at EMU, where he met regularly with Zehr. HOWARD ZEHR: You know, some people in prison are kind of done-in and they get worse. And then there are these people who the hardship makes them better, who turn out to be very resilient and learn from it and grow, and he's clearly one of those. A person who really takes it on themselves to change and learn from that experience have a huge contribution to make. They have experiences and authenticity that the rest of us just don't have. So he's in a position to make quite an impact in the world, and he's committed to doing that, in my experience. And in fact one thing Winship has going for him when he works with inmates is his own history. WINSHIP: I usually don't share about myself the first or second week until the second or third week, and share about my past story. And that changes how they accept what I say, because I'm one of them talking to them. Winship works at the Center for Conflict Resolution in Kansas City, Missouri, where part of his job is training inmates in conflict resolution. Last fall he was asked if he would do the same training with prison staff to deal with their conflicts. He plans to do that, but hopes to take it even further, and eventually have prison staff and inmates train together. WINSHIP: If I can get it implemented there in one small unit, and see if it can succeed there, it might be a model that could spread. Winship doesn’t claim that his own restorative journey is complete. WINSHIP: I have taken steps to try to mend relationships and try to repair that. It's a fine line to walk in that I don't want to cause more harm to people that I've already harmed, so I haven't been able to do fully restorative justice processes in my own experience, and yet I would be open to that. I think it would be the hardest thing I've ever done in my life. I think it would be harder than any day behind bars and any of the 20 years that I did. For WMRA News, I’m Christopher Clymer Kurtz.